The shoulders play an important role in any type of physical endeavor we choose to partake in. If you want to lead a healthy active life, let’s just say shoulders are important. If you are planning to or currently participating in any type of athletic doings, you really know how important shoulders are to athleticism. More important than the shoulders though are the actual shoulder joints and their ability to function properly. Without proper mobility and stability in the shoulder joints, doing any type of movement can become quite difficult. Although you might not realize it, the shoulders have an amazing range of motion. The shoulders are actually the most mobile joints in the body. The shoulders can abduct, adduct, raise in front, raise in back, rotate and practically move 360 degrees. The problem is most people do not have nearly the shoulder mobility that they should. If you are limited by a poor range of shoulder mobility or have some stability issues that are causing shoulder pain, you may want to pay close attention to this article. 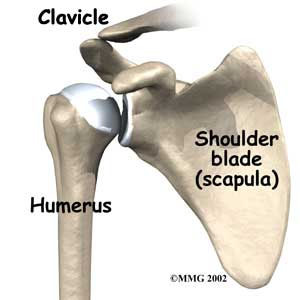 The shoulder joint is composed of three main parts. The three main parts are the Clavicle (collar bone), the Scapula (shoulder blade) , and Humerus (upper arm bone). Not being able to properly move thru just one plane of articulation can be a great hindrance to a person’s mobility or performance. The shoulder joints are involved in more movement than any other joint in the body. With that much range of motion the shoulder joints can easily be injured if you’re not careful. Most people could benefit from some sort of mobility work for their shoulders. If you cannot hit the 13 points of articulation with the shoulders comfortably, then a little mobility work won’t hurt. Did you know that something as simple as hunching over a computer screen for a few hours a day can greatly diminish your shoulder joint flexibility? The more you stretch or perform some mobility work the better it will be for your shoulders in the long run. Mobility work can be done three to four times a week for rehab or preventative maintenance. If you currently have shoulder issues consult a doctor before doing any new exercises. This is actually a movement used a lot in yoga. This exercise is great for warming up the shoulder sockets before doing any strenuous heavy lifting. It increases blood flow and mobility in the shoulder area. · Trying to keep your hands on top of your shoulders. If you have larger arms or shoulder or are inflexible this may be difficult but keep you hands as close as possible. This is another great exercise for increasing mobility in the shoulders and external rotation of the shoulders. · Use a slow controlled tempo and keep your arms braced against the wall. These are great because not only do they help build mobility but they also help stabilize the scapula. Simply using a dowel or broomstick should do the trick for a while. As you get stronger and more flexible you can step further away from the wall and use more weight. Remember though, we are trying to build mobility so using a lot of weight is not necessary on these exercises. · With the dowel overhead bend the arms back to touch the wall. Do not bend beyond your comfort zone. This goody not only increases posterior shoulder mobility but does a great job at working the rear deltoid muscles. Band Pull Aparts will help with scapula stability. These can be done with a bungee cord, resistance bands, and even some cable apperatuses in gyms as you get stronger. To have proper mobility and working shoulder muscles there must be a point of stability that everything stems from. This is not only for the shoulder joints but all the mobility joints in the body (hips, spine, wrist, and ankles). For this to happen in the shoulders, the scapula has to be working properly. A lot of times when people get shoulder injuries the first assumption is their rotator cuffs are hurt. While this may be the case some of the time, a lot of times people fail to address the scapula. This is very similar to when people get lower back, knee, or hamstring pain, they address one of the three but fail to look at the glutes or hips. If the scapula is not functioning properly, it will diminish the function of the rotator cuffs. The rotator cuffs will not to function properly because they are overstressed. Usually this is because the scapula either rotates forward or becomes misaligned. The Scapula is the point of stability when it comes to the shoulder joints. Strong shoulder blades will equal great shoulder mobility. If you think I am exaggerating try and find an upper body movement or exercise that does not involve the scapula in some way! By strengthening the muscles that support the scapula you also strengthen your shoulder joint support. 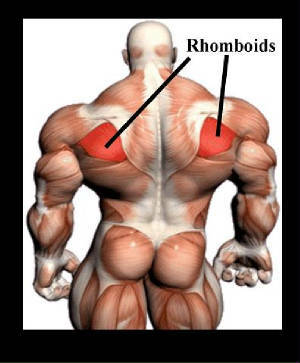 The main muscles we want to target are the rhomboids and the serratus. These are the two major muscles that attach and stabilize the scapula. While these are not the only muscles that support the scapula they are the largest and most supportive. Overhead Shrugs focus on the upper traps, rhomboids and involving the serratus. Overhead shrugs do a great job at pulling the scapula back. Because you can’t use nearly as much weight as normal shrugs you have to use more control and stability. Although this exercise stimulates all of the traps it does a slightly better job at stimulating the upper traps due to the positioning of the weight you’re moving. The problem with using regular shrugs is they involve a lot of mid to lower traps. Too much lower trap work and you actually depress the scapula. The Overhead Shrug can be one of the most important players in scapula stability. This is a good alternative exercise if you have trouble overhead shrugging or have limited mobility. Simply grab a pair of dumbbells with your thumbs facing upwards and do a lateral raiser, at the top holding the weight do a little shrug. This one develops strength and stamina in the rhomboids. Here you’re going to perform a barbell row off of the ground. The key to making this exercise really work is to never move your upper body higher than parallel to the ground and when you row the bar up, old it against your body for five seconds. This exercise will take the barbell row to a whole different level. This is a small movement but an effective one for the serratus. You can use anything from a dowel to dumbbells or barbells. Simply lie on an incline bench with whatever you chose in lockout position and push your shoulders forward. 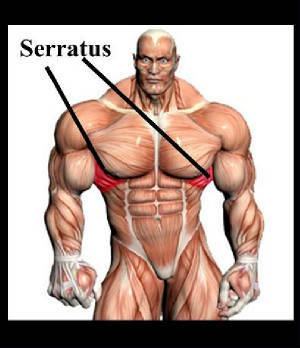 The movement will only be a few inches but it will really target the serratus. This one hits the serratus in two ways. Take a dowel or barbell and grip it with palms facing inward. Lift the bar or dowel upwards till it is slightly overhead and at the end give a little push outwards. Neutral Grip Face Pulls work by strengthening the rear delts. When the rear delts become stronger the scapula will be more upright because strong rear deltoids will hold the scapula upwards and externally rotated. Neutral Grip Face Pulls are great for preventative maintenance of the shoulders but also work well if you have limited shoulder motion. The shoulder joint is the most articulate joint in the body, with this much articulation the shoulders have a lot of mobility. When even some of this mobility is lost it can be quite the hassle to someone’s well being. If there is a loss of shoulder mobility one thing to look for is how the scapula is performing. If the scapula does not have proper mobility or stability it can cause some serious shoulder joint issues. Routinely performing mobility and stabilizing exercises for the shoulder joints and scapula will go a long way in protecting those areas from possible damage.